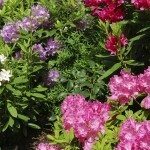 Does Ruellia thrive in acidic or alkaline soil? They thrive in acidic to neutral soil, but will tolerate most soil conditions. It is best to aim for a pH of 5.5 to 7 with 6 being just about optimal.